I set the sleeves in on this shirt perfectly in one go. Normally with set in sleeves I find I have to go back and restitch little bits where I’ve got a pucker. The pattern is Style Arc‘s Juliet shirt. I am liking Style Arc patterns more and more: their small seam allowances are so much easier to sew than standard 1.5cm ones. They use 1cm in most places and 6mm for things like necklines where there’s a tight curve and the seam allowance doesn’t need to be finished afterwards. 6mm sounds tiny, but it works. The collar on this went on very easily with no stay stitching and clipping required, just a few pins. The only downside is that I find it tricky to finish the smaller seam allowances where they have to be pressed open. I now overlock those edges before I sew the seam which works better for me. The picture was taken before I made the buttonholes but it’s all done now. Hopefully I’ll have modelled photos soon. Making this dress was a learning experience. It looked straightforward on the pattern envelope: a cotton shirt dress with very little shaping, rated Easy. But look a little more closely. The chest pockets are not simple patch pockets; they have tiny little gussets. There’s a slightly fiddly shoulder cut-out feature, which you probably can’t see on the first couple of pictures. And to get the prescribed clean internal finish on the neckline facing involves turning under and stitching smoothly around some extremely curved edges. Getting a good outcome on this one doesn’t call for a lot of fitting expertise, but it requires great precision at all stages of cutting and sewing. I found it a moderately challenging project; more of an “Average” than an “Easy”. Here’s the original envelope picture. I kind of wish I’d made mine in white too, although I know that in reality I wouldn’t wear it much if I had. A lot of the detail is lost in a darker fabric, particularly that beautifully shaped neckline facing. I top-stitched mine on the machine (the original is hand top-stitched with a running stitch) and it blends in a bit too much. I also considerably shortened the front and back slits to make my version bra-friendly. Sizing is consistent with other Vogue patterns: as usual I made one size down from the one the size chart suggested and added 5cm length. The shoulders are surprising. The small cutout gives a very square shouldered effect, especially from the back, despite the actual shoulder seam being dropped. 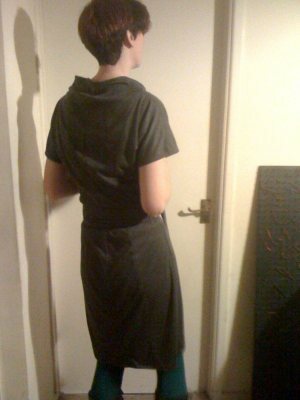 If I made this again I think I might pinch out a bit on the back shoulder to soften the line. On the other hand, it’s certainly a dramatic effect. And it’s a version of the current cold shoulder trend that I actually like, which is unusual. Choosing interfacing for this was tricky. The shell fabric is a black cotton poplin shirting from Croft Mill. I interfaced with Vilene G700, a lightweight woven fusible, and I think even that is a touch too heavy. But on the other hand you need some structure around the cutouts and the splits. Self fabric interfacing might work well. Getting a clean edge on the facing is a nightmare. I block fused it, which was probably my first mistake. The pattern has you turn and press a tiny little hem, trim it down even further, and then edgestitch it. I stitched a guideline along the foldline first which was a great help but it was still tricky to do on the interfaced fabric and I burnt my fingers a few times. I am wondering if the facing would be better made of two layers of shell fabric stitched together and then turned out. Or perhaps even the technique where you sew a layer of fusible interfacing to the facing with the non-glued side of the fusible to the right side of the fabric, turn out, and then fuse the two layers together. The instructions for facing the cutout edge along the top of the sleeve were similarly fiddly, although there I’m not sure I can come up with any improvement other than binding the whole armscye seam, which is also a faff and means making bias binding from the shell fabric. However there was an awful lot of ‘sew a 1.5cm seam and now trim this edge down’ in the directions where it would have been simpler to just cut pieces out the right size to start with and instruct the maker to use a smaller seam allowance. I sound pretty grumpy here but in fact this pattern was a good workout for the brain and I have worn the end result. It needs a wide contrasting belt to look good, which is faff, but I like all the pockets! I’m kind of tempted to try making it again just to try out my construction thoughts…if only I had the time. So one thing about overlockers is that most of them come with a feature called differential feed. This lets you vary the ratio between the rate at which fabric is fed in and out of the area under the presser foot and needles. It is supposed to be a magical fix for tricky fabrics where seams won’t lie flat. If the seam is stretching out you make the inward feed faster than the outward feed, and if it gathers or puckers you make it slower. This sounds great in theory and you can find loads of blog posts explaining it. It’s also what my machine’s manual suggests to do to correct stretched or gathered seams. But it never really works for me. I can see a small difference when I adjust the feed, but I often find I get gathered edges on lightweight fabric even with the differential feed down at the minimum. This sample is a case in point: three thread overlock seam finish on a lightweight fabric with the differential feed at 0.7 and everything else at the default settings. Awful. The problem seems to come from the needle thread; the loopers look fine. Reduce the needle thread tension, and suddenly all is well. Does this happen to anyone else or is it just that my machine has overenthusiastic tension? 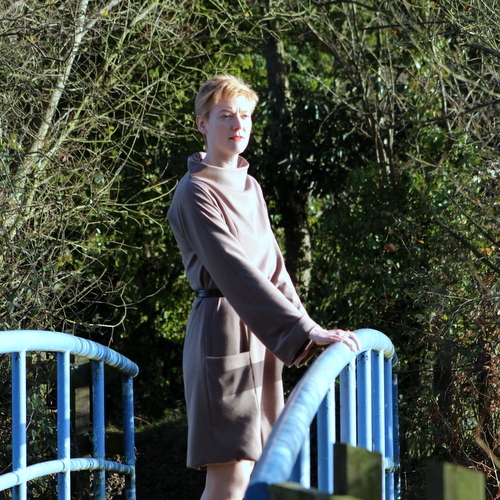 Here’s version 2 of Burda 106-04-2014, the x-wrap dress. This one is made in one of the most awkard fabrics I have ever tried to sew: a very lightweight, slightly sheer silk. I normally steer well clear of such things but it was a very cheap bolt end in the sale room at Misan Textiles, there was just enough of it for the pattern, and I couldn’t turn down that almost fluorescent orange colour. I hate cutting out shifty fabric. I did a bit of googling for tips for dealing with lightweight fabrics. A lot of sites suggest spray starch but there seems to be no consensus as to whether you should press starched fabric with or without steam, and lots of warnings about potentially burning the starch and marking the fabric if you get the iron too hot. Eventually I came across this recipe for using gelatine to stiffen chiffon before cutting and sewing. The method seemed pretty clear and sensible so I gave it a go – thanks Jo! The gelatine I could get came was in leaves rather than a powder and was ‘platinum grade’ – apparently there are lots of other grades available and they have different setting power which makes it kind of tricky to substitute. I think I used three leaves to three litres of water. It certainly stiffened the fabric and made it a lot easier to cut and sew. The downside is that you can’t use any steam when pressing or the fabric might go sticky. And the fabric didn’t press well without steam as you can see from the generally wavy effect. I washed the dress once it was finished but it doesn’t seem to have completely removed the gelatine as the fabric is still less fluid than it was when I bought it. On the upside it doesn’t wrinkle as badly as I thought it would. These photos were taken after wearing the dress all day. I didn’t press it at all before we went out to take them, so what you have here is what it really looks like after a day’s wear. Maybe more washing will gradually soften it up again. I already posted about my fitting and facing changes but I also left out the zip as it’s not needed, and slip-stitched the shawl collar down to the outer neckline seam to make it stay put. 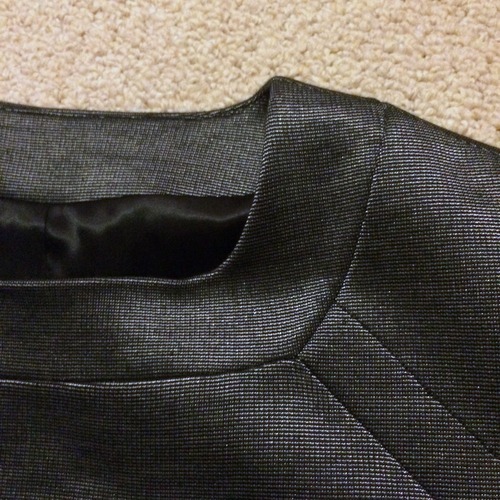 I couldn’t use interfacing with this fabric so the sharp points where the wrap pieces grow out of the front of the dress are reinforced with bias squares of the outer fabric sewn to the wrong side along the seamlines. 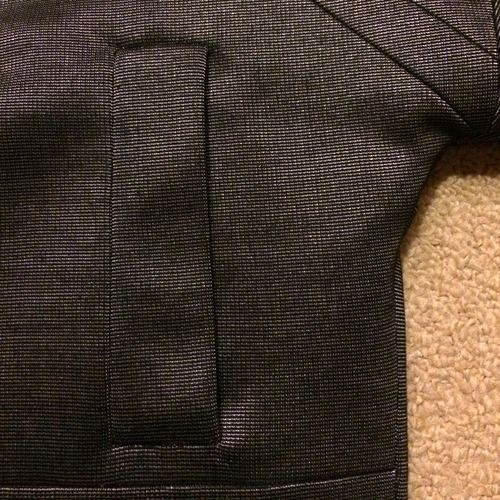 I kept the inseam pockets, which are a lot easier to sew when you don’t put a zip in the seam right next to a pocket. I tried to take a little more care with the hem on this version but it’s even worse than the brown one: uneven and very wavy. I hoped it would look a bit better after washing the dress and pressing with steam but no. I’m not going to unpick it as I don’t think a second attempt’s likely to be much better and the fabric might not survive the experience. It looks less fragile in the pictures than it is in real life. I don’t think this is as successful as the brown version, but it’s a perfectly wearable summer dress (well OK, wearable with a slip) and I love the colour. The fitting changes seem to have worked too. Two copies of this pattern is enough for now, but it’s one I might go back to at some point. This was my first version of Burda 106-04-2014. No sooner than it was finished I started working on a second one and took the opportunity to tweak the pattern a little. The version above isn’t bad, but the sleeves are a little constricting and I felt I could do with a bit more room in the bust. I don’t know you’re meant to do a full bust adjustment on this sort of pattern but here’s what I’ve done. The picture below is the front pattern piece, which is cut on the fold. In the pictures below red areas are bits I’ve added and blue is where I have taken away. I slid a chunk of the front out sideways to give a bit more bust room, and reduced the shoulder width so that the shoulder seam would be sitting on my shoulder point rather than slightly over it. Those two changes affected the length of the armscye so I had to make the sleeve wider to match. No bad thing as the original sleeves felt slightly tight; I’d been planning to flatten the sleeve cap anyway. That’s it for fitting alterations, but the fabric I’m using is slightly transparent and so I also needed to do something about the neckline finish. The original design has a skinny back neck facing which is a single interfaced layer, overlocked on the outer edge. That clearly isn’t going to look good in a sheer fabric. Also the facing didn’t behave well on the first version and had to be top-stitched down to keep it in place. I did a bit of snoop shopping to see how this sort of thing would be handled in ready to wear clothes. I found very few summer dresses with facings. Most were lined. A few, mainly in casual fabrics, had the neckline seam covered with a strip of binding. The ones which did have facings all had a centre back zip with the facings sewn to the zip tape to hold them down. The facings themselves were invariably much wider than those on the Burda design. I didn’t fancy trying to bind the neckline seam in slippery silk, and I had nothing to line the dress with, so I had to stick with a facing. Although the original design has no centre back seam I had already had to add one because of a shortage of fabric, so I figured I could sew the facing to the seam allowances on that or stitch in the ditch to hold it in place. To try to make it look nicer I made the facings much wider around the neck than the original and cut two copies of each piece. Those then get sewn right sides together at the outer edge and turned out to give a facing with slightly more body than a single layer and a very clean finish to the edge. And here’s what it looks like. Acceptable if not brilliant, and probably the best I could manage with lightweight silk. It is not well-pressed for excellent reasons I shall go into in my next post, and I should have done a french seam on the centre back but life’s too short. It’s wearable and the facings stay put and that’ll do. Next up, modelled finished object pictures. With some makes the pattern comes first and with others it’s the fabric. In this case it was definitely the fabric. It’s a fairly heavy-weight stretch denim with a thick coat of gold paint. The underlying fabric is a brownish black, not that you can tell. I’m a sucker for anything metallic, and stretch denim in any colour other than blue is scarce in the UK, so I snapped this up as soon as I saw it. Originally I thought I might make a jacket, but I eventually realised that jeans would get far more wear. These are Burda 103-07-2010, a skinny trouser pattern with a little extra seam interest. It’s a really good pattern; I’ve made it a few times. Technically speaking it’s not actually a jeans pattern as there are no flat-felled seams or rivets involved, but made up in denim it certainly gives a similar look. You can see how far forward the side seams are in this shot. I added back patch pockets and lowered the waist about an inch. The original pattern is designed to hit the natural waist. I also added a bit of length to the legs beyond my standard adjustment for extra height. I had a bit of trouble choosing top-stitching thread. The gold paint is bound to wear off over the lifetime of the garment so I wanted to pick a colour that would work with both the gold and the base fabric. My first choices were black or a bright brown, but the black was too harsh with the gold and the bright brown clashed. I ended up with a dull brown which looks fine with the gold but not so good with the brownish-black base fabric. I guess I’ll just have to wash these as little as I can get away with. The belt loops were slightly tricky. The pattern would have you sew a skinny tube and turn it out. I tried, but the fabric was far too thick to turn. It might have worked if I’d cut the belt loops on the bias but I didn’t want to waste fabric. In the end I cut a rectangle three times the width I wanted, overlocked one edge, and folded it in three as in the picture below. When I top-stitched the belt loops I was careful to go far enough in to catch down the overlocked edge. But the real question is how practical are these? I made them a few weeks before writing this post and they have actually had some wear at weekends. I think they look best dressed down with boots and a sweater. I’ve got two more metres of the fabric left…maybe a skirt? Thanks so much for all the nice comments on my silver version of Vogue 1335. I said I’d post some detail pictures next so here they are. Welt pockets first. The silver colour is actually a very fine silver and black stripe – probably about a millimetre wide. 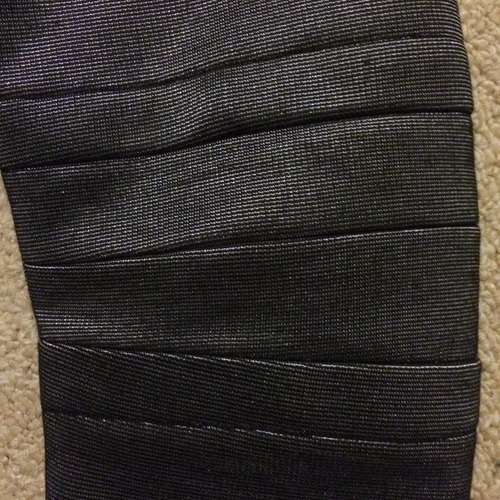 The stripes made lining up the welt pockets nice and easy, although you can see it’s not perfect. The welt is an even width though; it’s the picture that’s on a slant here. Cutting out with those very fine stripes was a pain in the neck. There are a lot of strong horizontal and vertical lines in the design so if the grain was slightly off it really showed. I cut a lot of pieces single layer because of this. It’s still a stripe or two off in places. I interfaced all the pieces of the top with Vilene G405 to give it plenty of body. Unfortunately it wasn’t until this point that I noticed that my fabric shrinks when pressed. Luckily I’d cut the pieces out with the usual generous 1.5cm home sewing seam allowances so I could afford to lose some of those. However in a few places this design has extra wide seam allowances which are pressed to one side and top-stitched down to give the appearance of bands. I had to reduce the width of the top-stitching slightly because otherwise the fabric shrinkage would have meant I wouldn’t have caught the seam allowances at all. Here’s the neckband. The upper diagonal line coming out from the neckband looks like a seam but is actually one of the lines of top-stitching. I used Gutermann top-stitching thread so it would really stand out against the fabric. I marked the line with chalk before top-stitching as the seam it has to run parallel to is too far away to be able to simply line up with something on the machine presser foot. You can just see the lining here; it’s acetate/viscose satin from The Lining Company. Details of the sleeve bands below. The top and bottom seamlines are more top-stitching. The top-stitching interacts with the stripes in an annoying way where the stitching line is almost but not quite parallel to the stripe: it gives a stepped effect which you can see here on the lowest line of top-stitching. I found that using a smaller stitch length reduced the effect but didn’t eliminate it completely. I think I’ve done this pattern to death now; between this version and the last it’s been about seven blog posts. I’m aiming to sew a completely new-to-me pattern next. I’m getting the Star Wars thing out of the way in the title, because there’s no denying this dress is something a Jedi would wear. It’s not just my version though: look at the envelope art below. All the girl in brown needs is a lightsaber to hang off her utility belt. And I can see Princess Leia in the white outfit although obviously she’d have some amazingly elaborate hairdo to go with it. Anyway. This is Vogue 8512, a pattern from the Very Easy range that I was given for Christmas when I first started sewing. I don’t think it stayed in print very long; there are only two reviews on Pattern Review which implies it wasn’t particularly popular. It certainly is a simple pattern in its original form: kimono sleeves so nothing to set in, princess seams for easy fitting, and there are only four pattern pieces to worry about as the lining is cut from the same pieces as the dress. The pattern has a zip down the centre back but it’s not needed if you use a fabric with any stretch. 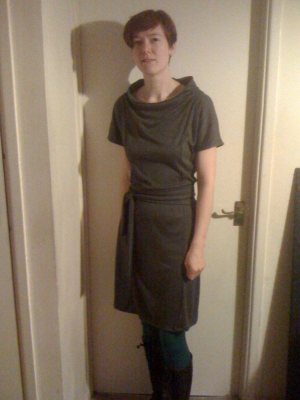 I made it up in dark grey doubleknit when I first got it and skipped the lining, substituting a facing around the neck. I never managed to get the neck to stand up as well as the one in the envelope picture though. This was way before the blog but there are some murky photos of that version here and here. Recently I was going through my stash trying to reduce it a little and found some mocha ponte double knit. I had a plan for it when I bought it, but life moves on and the dress I’d originally intended won’t work for me any more. So I went looking for an alternative pattern with long sleeves, pockets, and a skirt I can cycle in. Nothing completely fit the bill, but Vogue 8512 looked easy enough to alter. I traced it again and altered the pattern to have large pockets in the princess panel. I also extended the sleeves to full length. I then made separate pattern pieces for a lining with facings of the body fabric around the neck, rather than simply reusing the body pieces for the lining. I was also determined to make that boat neck look like the one on the envelope. I interfaced the neck area with some knit fusible, but that didn’t look like it would give enough shape so I also attached two layers of poly organza to the wrong side of the facings before sewing them to the dress. This was not a scientific process: I tore a couple of rectangular strips of approximately the depth of the facing and basted them along the neck seam, letting the bottom edge of the organza hang free. It seems to have worked: the collar stands up on its own. I honestly did not adjust it at all for the photos, and it was a windy day when we took them. There’s a back zip in this version because despite using a stretch lining (The Lining Company’s stretch poly satin) I wasn’t sure if I’d be able to get into it without. It turns out there was no need to bother. But it’s a good invisible zip insertion. The lining was bagged: I’m proud to say there isn’t a stitch of hand sewing in this dress. I didn’t make a perfect job of it; the lining tends to pull on the lower hem a little, hence some of the strange shapes in the pictures above. The sleeve hems don’t seem to have the same problem. But now I’ve figured out the process I’ll do a better job next time. Although this is certainly a practical dress and I’m going to wear it, styling it is a challenge. It definitely needs a belt. The one above is the best out of the ones I already have, but I think it needs something slightly different so I’m looking for a new one. Right now I’m wavering between canvas webbing or full-on metallic. Suggestions welcome!